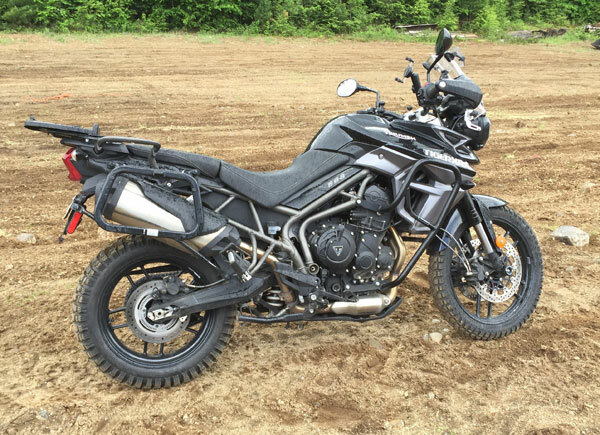 My 2016 Triumph Tiger 800 XRx has proven its awesomeness, both on the street and off-road. To gain even more confidence in rough terrain, I swapped the stock Metzeler Tourance Next (90% road/10% off-road) tires for a set of Mitas E-07 Dakar Dual Sport/Adventure bike 50/50 buns. Mitas (pronounced Me-tass, think “Meet us”) has been around for a while as a maker of agricultural tires, but also manufactures vintage, moped, scooter, flat track, speedway, street and off-road motorcycle tires and is now becoming one of the go-to tires for Adventure (ADV) bikes. Since I have not tried the most well-known players on the ADV/DS tire spectrum, I cannot make a direct comparison. So, the review is of my impressions of this tire only. Disclosure: Even though I bought the first “Dakar” set from Twisted Throttle, MotoRace/Mitas generously supplied me with the second “Standard” set so I was using the correct tire for my weight and bike. See more about the different versions below. 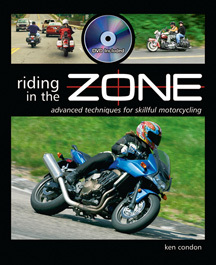 On the street, the Metzeler Tourances were fine, but felt numb. This became even more apparent during a track day where the Tourance tires could not communicate well enough to instill much confidence. Grip was good though; I managed to corner hard enough to mangle both of the Tiger’s footpeg feelers. The Metzelers were also fine for the easy packed and semi-packed graded roads, but the lack of feedback made me wonder whether I was about to push the front tire right out from under the bike on gravely surfaces like I did on the Multistrada last year. Another reason for the swap to more off-road worthy tires was for an intermediate-level ADV course I was taking with Jimmy Lewis at the Dirt Daze rally in Lake George. After talking with knowledgeable ADV friends, I decided on the Mitas E-07 50/50s. Reviews suggest that they would provide good mileage, fine road handling and wet weather traction, as well as really good off-road capabilities. The aggressive tread suggests that they will climb anything I plan to tackle, but I wondered just how good they’ll be on the street. I had them mounted just before I was to take a 1500 mile trip to North Carolina, so I was about to find out. The wandering feel of a knobbie-type tire on pavement takes some getting used to. 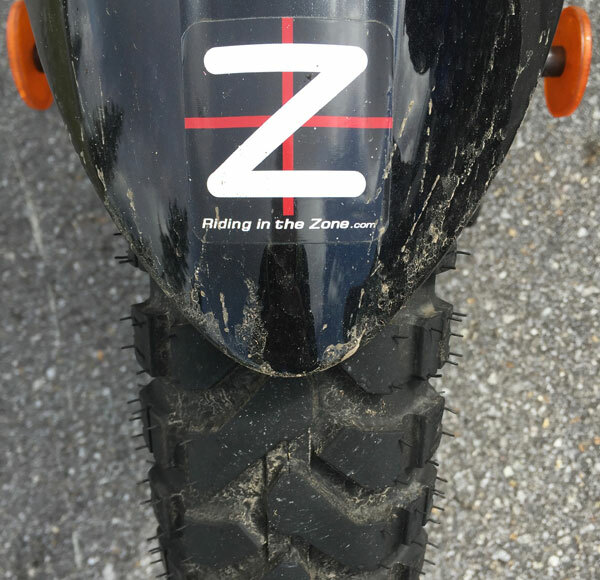 I ride my KLX 250 on the street at a sporting pace with full knobbies, so I am comfortable with how an off-road tire feels when cornering on the road. Despite the usual weird sense that the tires are about to slip out from under you (they won’t), the E-07s provide plenty of grip on both dry and wet pavement. I did 1400 miles through VA and NC, including a run of Deal’s Gap and the Cherolhala and had a blast. That was with the bike being loaded with camping gear. No, the E-07s aren’t as sure-footed as a road tire and I wouldn’t do a track day on them, but they were absolutely fine as a street tire. One thing you will notice when riding with these tires on pavement is the high-pitched whine and the added vibration caused by the aggressive tread. I like a quiet tire, so this was a compromise I was going to have to tolerate in order to enjoy the more capable off-road qualities. It turns out I got used to it pretty quickly. However, it took me longer to acclimate to the abrupt turn-in and oversteer. 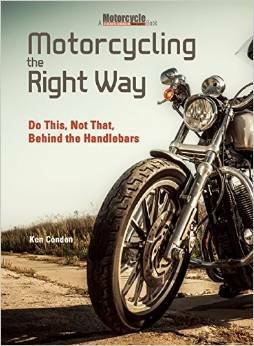 To keep the bike from dropping too quickly and too far into a lean, I had to countersteer on the outside handlebar. 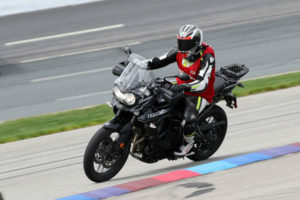 Mike, a student of mine, also commented on the quick steering characteristics after he mounted E-07s on his Super Tenere. This quick-turning behavior is to be expected from an off-road tire where nimble maneuvering is a priority over stability. There is always a compromise. The remedy is to mount a wider front tire: I inadvertently ordered a 110 front tire from Motorace instead of the stock 100 size tire. This proved to be a very good thing as the wider front tire took care of the annoying oversteering problem. So, Tiger XR owners, order the 110 front! 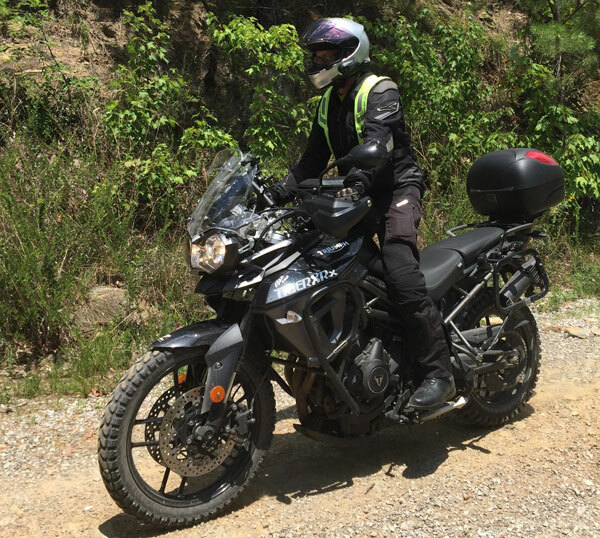 If you mount dual sport tires, whether they are 90/10 or 50/50, you will have to endure a stiffer ride compared to a street-only tire like the Dunlop Road Smart. The carcass has to be stiff to handle rocky and rough terrain you’re likely to encounter. Again, compromises must be made. My first off-road excursion with the E-07s was, um, interesting. Here I had a set of very aggressive tractor-like tires, yet the Tiger’s traction control kicked in almost as soon as I tried accelerating up the first gravel hill. Okay, I had forgotten to switch to “Off-Road” mode, so the TC was on full “nanny”. But, still. The 90/10 Metzelers would have at least allowed me to make it up the hill. Switching to the correct mode helped, but the TC was still going nuts. I now realize that the Tiger’s TC electronics must have needed to re-calibrate itself for the new tires. I never had that problem again. I can tell you with great confidence that these tires rock off-road! The Mitas tires give me so much more confidence that I now tackle some pretty gnarly terrain that I never thought I’d experience on the Tiger. This is good…and bad. Bad because it would be easy to go places that the tires can handle, but that the bike may not. Easy there, Tiger. 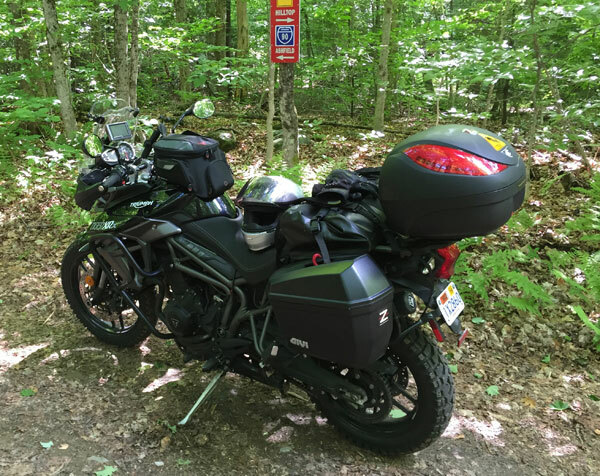 In New England, most of our ADV-type riding consists of packed dirt, lose gravel, rocky outcroppings and mud. We don’t have a lot of sand, so your results may vary in those conditions. I experimented with tire pressures to try and help soften the rough pavement ride from the stiff Dakar carcass. I also wanted to find a pressure that will balance road wear and off-road grip without needing to air-down for dirt and then air-up later for pavement. The stiffer Dakar tire did well when set at mid-to-high twenty pounds of pressure. I expected the tire to wear faster, but the ride was better and off-road traction was great. With all this awesome off-road grip, you’d expect the Mitas E-07s to wear quickly on the street. Well, you’d be wrong. I hear that the Conti TKC-80s only last about 3,000 miles. In contrast, I put 4,500 miles on the Dakar set and there was at least another 2,000 miles left when I decided to change the rear. See photos. I changed the rear before it was completely worn because the flattened profile became annoying enough that I made the swap to a new rear. I would have been happy enough riding these things down to the wear bars, but I had a new rear in the garage, so made the swap early. When new, the E-07 has a stabilizing bridge that wears down flush to the center strip in about 1500-2000 miles. The 150 section Heidenau also has a center strip, but it is much wider than the Mitas, making the Heidenau not as good for climbing once the center lugs wear flat to the bridge bars. In contrast, the Mitas has great centerline grip throughout its whole life. Note that the wear bars are NOT at the center of the tire. The wear bars are the deeper bars that are off center (see photo). Update: The rear tire now has 6,500 miles and still has meat left on it for another 1500 miles, I bet. The front tire is at the wear bars at about 7,000 miles and the blocks have worn unevenly and cupped. That’s at 28 pounds front and rear. When I bought the first set of tires I did not know the difference between the Dakar and the Standard model. The Dakar version has an additional belt to add more durability and stiffness, which makes sense for heavier riders on big(ger) ADV bikes, like the R1200GS who mount hard luggage and load their bikes to the hilt. That’s not me. The “Standard” version makes more sense for a lightweight rider on a Tiger 800. That said, there is an argument for mounting the stiffer tire on bikes with cast (as opposed to spoked) wheels to protect them from getting damaged over sharp rocks. NOTE: Twisted Throttle has only the “Dakar” version of the E-07 in stock as of this writing, but I’m sure they will get you the “Standard” version if you ask. Buy These Tires…If You Can Really Use Them. The Mitas E-07 looks tough as nails, rides well on both wet and dry pavement and does really, really well off-road. I didn’t think I’d like them as much as I do. I say, go for it! But, before you decide to buy these or any 50/50 tire, be realistic about whether you really need this level of off-road capability. Sure, they look cool, but if your riding is 95% road, then the 90/10 tires will likely suit your needs just fine and be more pavement-riding friendly. 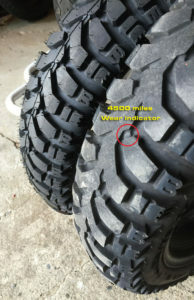 Buy your Dakar versions tires from Twisted Throttle and help support this blog. They also have quality luggage & racks, riding gear, electronics, auxiliary lighting, bike protection, and much more. Happy shopping! Great stuff Ken… I just got an 800 ‘Roadie’ and so far really love it. Will definitely try the Mitas program when time for new tires. I run these(dakar) on my ktm 990 adv. I love them. I switched from dunlop rally raid 908’s so these felt like sport bike tires on the street. Those dunlops and tall suspension were awesome in the desert but going 80+ on rain groove highway was unsettling to me. I’m sure they would stick but I felt like the bike could slide out from under me at any second. I like the Mitas so much I wouldn’t consider anything else for 50/50, so I’m glad to read someone else that really likes them. Interestingly I found your article because I was thinking off picking up a used 2016 xrx for street and traveling and moving my 990 back into mostly dirt duty. I liked this and your long term owner update article. Good stuff! Finally got to read your article 🙂 ..after I bought the E-07 Dakars for my 14 roadie. Thank you. A couple follow ups if I may. WOuld the added vibration tend to tire you out on a long trip (like to AK) or just a minor thing to get used to. And finally, I’ve seen some use the E-07 on rear, and a TKC 80 in front. You see any benefits in doing that? Thanks again for your time. You get used to the vibration, but it’s noticeable especially when you first ride with the E-07. I haven’t heard about the TKC combo, so I can’t really comment. Great article, Ken. A couple questions: I have a 2014 Tiger 800 roadie. Had Anneke 3 tires put on prior to CA to Alaska trip last summer. Great on road, but very iffy on gravel roads, side trips, etc. Leaning towards trying the Mitas E-07 for next trip. Safety and comfort is first priority, lifespan and cost very secondary. Is it still reasonable in your view to go with this 50-50 tire even though so much of trip is on pavement, with moderate side trips on unpaved roads – along with the inevitable construction zones/road repair sections of gravel roads here and there throughout Canada and AK. Also, I see you recommend the 110 size front tire instead of the usual 100. Is that mainly to improve on-road performance? Or is that for off-road benefits? And finally, are there any downsides to switching to 110 instead of 100? Thanks so much. The one problem with the E-07 for long road use is vibration. I would have no issue using them for pavement. The 100 front made the 19″ front wheel insanely nervous, so the 110 is a must IMO.